1. Don't let good players get away. Last offseason saw the departure of three consistent starters from our roster, all of whom went on to better things after leaving DC. Troy Perkins, Bobby Boswell, and Brian Carroll were all impact players for their new teams in 2008. And let's not forget our former MVP Christian Gomez! The DC front office has already made strides to correct this issue by re-signing Clyde Simms, and extending the contracts of McTavish, Burch, and Quaranta. But they still need to finalize a deal with Bryan Namoff, and the club should also make a strong attempt to bring Francis Doe back next year as well. 2. Stay out of South America. The biggest story last offseason was our acquisition of five new players from South America. Well only one remains under contract today. Even though the continent has delivered us some great players in the past, the front office should learn that you can't just take a soccer player from abroad and drop him into your lineup and hope for the best. That's not to say that DC shouldn't acquire ANYONE from a foreign league this offseason. We just need to make sure he fits into our system. There was a willy-nilly feel to our foreign approach last season, and that needs to be corrected through additional scouting and interviewing. 3. Use your DPs wisely. Marcelo Gallardo and Luciano Emilio are both set to return as Designated Players in 2009. Each has the talent to be among the top players in MLS, but that didn't show in 2008. It will be Tom Soehn's task to find a way to bring the best out of both of them. Maybe that's by changing the formation, maybe that's by upgrading or shifting around the supporting cast. If Soehn can't find a way to translate our upper echelon talent into upper echelon results, he might be looking for another job in 2010. 4. Utilize the draft. As my previous post revealed, only 24% of United's roster was drafted by the team, as opposed to 45% of players in Houston and 44% of players in New England. In MLS, as in many other professional sports leagues, a key to victory can be to draft quality talent, raise them in your system, and retain them. As we've seen, that method has worked out very well for the Dynamo and Revolution, but United has instead opted to build through international acquisitions. It's fine that we pride ourselves in discovering players from foreign nations and bringing them to the league, but that doesn't mean that we can't also get more out of our draft picks. With two selections in the first round, and with an apparently strong draft class, including a trio of Genaration Adidas Terps, DC should absolutely be able to draft a couple guys who can contribute in 2009 and for years to come. 5. Bury the 3-5-2. Sure, this formation has worked occasionally for some MLS teams. But unfortunately no one who plays defense for DC will be confused for Michael Parkhurst anytime soon. The 3-5-2 isn't an altogether horrible formation, but without speedy defenders who can stay organized and won't get beaten easily, and without a group of wingers who can contribute on both sides of the ball, we just don't have the personnel to make it work. Early in the 2008 season, DC attempted a 3-5-2 formation far too often, and I don't want to see it in 2009. 6. Roster stability is the key. As most of the above points have shown us, it's tough to win when you're constantly bringing in new players without an eye for the system, failing to retain proven players, and not building around the guys who you've already got in place. 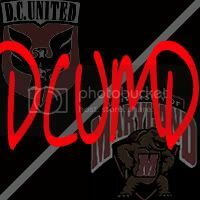 In 2009, I'd like to see DC United return all of their starters, add at least two college players who we can count on for occassional minutes, and maybe one or two foreign acquisitions with a specific target role in mind. Here's to a happy 2009! May it be full of wins, shields, and cups! I agree with you on most counts, though I think it's a bit premature to bury the 3-5-2 entirely. I wouldn't want it to be our primary formation, but it does have its uses. How about we not have so many injuries this year? Our roster size is 24 now and we don't have as many games as last year, this would be a good time for everyone to stay healthy and get hungry. Good comments. Hooligan is right that we got away from the quick counterattack too much in 2008. Need more through balls to Fred on his diagonal runs too. Drew - I like that. Another good resolution would be to hire a better conditioning/injury prevention team. United sure has accumulated a whole lot of frequent flier miles with all those hernia related trips to Germany and back.